Deuce’s whole world has changed. Down below, she was considered an adult. Now, topside in a town called Salvation, she’s a brat in need of training in the eyes of the townsfolk. She doesn’t fit in with the other girls: Deuce only knows how to fight. To make matters worse, her Hunter partner, Fade, keeps Deuce at a distance. Her feelings for Fade haven’t changed, but he seems not to want her around anymore. Confused and lonely, she starts looking for a way out. Deuce signs up to serve in the summer patrols—those who make sure the planters can work the fields without danger. It should be routine, but things have been changing on the surface, just as they did below ground. The Freaks have grown smarter. They’re watching. Waiting. Planning. The monsters don’t intend to let Salvation survive, and it may take a girl like Deuce to turn back the tide. Oh dear gawd Outpost was amazing!!!!!!!!!!!! I loved Enclave but I really think that Outpost was better! Ann’s writing and world building is just beautifully done. I love the addition of Topside and the new characters we get to me as well as our old favorites from Enclave. The story made some dramatic changes; like it didn’t seem as dark but I loved every minute of it. Stalker. Something that Fade may not be able to give to Deuce. Oh and the Freaks? They get really freaky in this book! We find out some interesting things about them. I chose a passage, well there were a few actually bookmarked lol between Stalker and Deuce. Even though I love Fade. Stalkers passages seemed to stick out to me more. There are some blank parts because I didn’t want to be too spoilery. My jaw dropped. Comfort? I didn’t expect that from him. “Why would you---“ I couldn’t complete the question, couldn’t accuse him of being secretly glad __________________. “I’m sorry,” I said miserably. 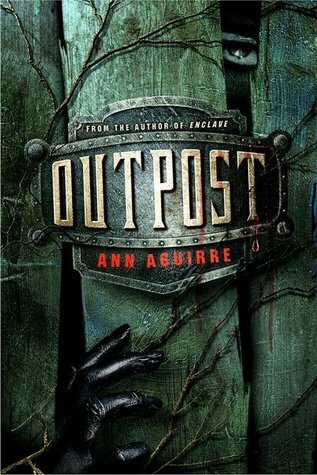 Add Outpost to your Goodreads lists! Pre-order your copy now. And also make sure to get the novella it's Stone and Thimble's story! I shall get it soon!!!! Argh T_T you obsessed over it?????????? I'm so happy this book was SO good. I LOVED the first book and now I desperately want this sequel. Fab review! Oh! I so can not wait for this one!!! I am very very jealous of you right now! Glad to hear it is so good!!! An awesome review! I absolutely loved Enclave and have been anxious for Outpost ever since, I can't wait to get hold of it, even more so since reading your praise. I just finished reading Enclave recently and love it. I am really looking forward to Outpost!! Great review!! I am looking forward to Tegan and Stalkers character growth. I really do like their characters as well as Deuce and Fade!! I love love love love love Enclave and I can't wait to read this it sounds great! Thanks for sharing your thoughts! I am dying for the release of Outpost! I absolutely loved Enclave and need more of this series. I'm really interested to see where things with Stalker go. I recall some readers finding him absolutely horrible given the acts of his pack against Tegan so it'll be interesting reading for sure. Thanks for the teaser passage! Lol. Sept 4th can't get here soon enough!